There is a requirement for an electronic nose to detect 2,4,6 TCA directly in wine aroma and corks in a similar manner as humans do. TCA in wine results in what is mostly called ‘corked’ wine. The precursors to TCA originate in the wood of the cork tree (Figure 1) TCA is supposed to form when these hydrocarbons join with chlorine used to bleach the corks prior to use. Figure 1. TCA is often introduced into wine from the cork used to seal the wine bottle. Illustrated in Figure 2, the chloroanisole series of compounds comprises of the anisole backbone with growing numbers of chlorine atoms attached. Figure 2. Chloroanisole family consisting of (A) chloroanisole (B) dichloroanisole (C) trichloroanisole (D) tetrachloroanisole, and (E) pentachloroanisole. One of the key reasons for corkiness in wines has been established to be 2,4,6- Trichloroanisole. 2,4,6 TCA has the same smell as musty old newspapers. Figure 3 shows the detailed information on 2,4,6 trichloroanisole in tabulated format. This compound and other halogenated phenols and anisols result from microbiological processes and are formed by biomethylation and dehalogenation. The odor threshold of these substances is in the low ppt range and so their analysis in tainted wines generally requires more or less complex sample preparation like liquid/liquid extraction, solid phase extraction or distillation methods, frequently with the disadvantage of organic solvent use. Measuring ppt levels of TCA in wine is also hard because there concurrently are plenty of other compounds in wine with part per million concentration levels. Gas chromatography is the basis of the zNose®. The zNose® is a small and portable handheld instrument, as shown in Figure 4. Conventional gas chromatographs (GC) are much larger instruments, which use an ovenized long (10-100 m) capillary tube (column), coated with a stationary phase to speciate or separate a sample vapor (mobile phase) into its individual chemical parts. A long-column GC is capable of very high resolving power but is also highly slow with typical measurements taking between 30 minutes and an hour. The zNose® is a portable GC, which attains 10-second speed by use of a direct heated, one-meter column, and a new solid state integrating GC detector. The zNose®’s sensitivity is comparable to a long column GC fitted with an electron-capture detector. High speed (in seconds) requires a trade-off in resolving power; however, satisfactory resolution is maintained for a number of quality control applications such as detecting TCA in drinking water and wine. The zNose® has a rechargeable internal helium tank adequate to perform over 400 measurements and a vapor preconcentrator so that weak vapors can be sampled and preconcentrated before analysis in the rapid GC column. Figure 4. Handheld version of the zNose together with temperature controlled sample holder for 40 mL vials with sealed septa lids. The zNose® is presently the only electronic nose that can be directly calibrated with chemical standards of recognized concentration according to recommended EPA/FDA procedure. Figure 5 shows the response of the zNose® to headspace vapors from a water source containing 1 part-per-billion (1000 ppt). Figure 5. Calibration results using 1 ppb water standard. Calibration for TCA detection is done using headspace vapors from water standards. By carefully weighing TCA crystals and dissolving them in methanol, a spiking solution of known concentration is produced. The water is then spiked with the methanol spiking solution (microliter quantities). The two compounds illustrated on either side of the TCA response (peak) in Figure 5 are because of trace quantities of pentachloroanisole and dichloroanisole. The water standard comprises of 20 mL water in a septa sealed 40 mL vial. The response shown in Figure 5 was gained by preconcentrating 5 mL of headspace vapor in <1 minutes followed by a <1 minute GC analysis. Under these conditions, the signal to noise was 40 to 1 which caused a least detection level for 2,4,6 TCA in water of around 25 parts-per-trillion. In the case of longer sample times (e.g. 60 seconds), the zNose® is allowed to regularly attain detection limits below 1 parts-per-trillion in water. The zNose® can also produce a virtual sensor specific to TCA. Once the sensor is calibrated, it can measure the concentration of TCA vapors confined within a volume of sampled air. This feature is beneficial when screening storage areas, wine cellars, containers, or cooperage for traces of TCA contamination before use. Figure 6 shows microliter quantities of the methanol spiking solution injected into an air filled 40 mL vial and sampling generates the calibration response. In this case, 5 mL of air containing 500 picograms/ milliliter TCA creates a response factor of about 3.6 Hz/pg. With a noise floor of 10 Hz, the least detection level is around 3 picograms. With the zNose® technology, old issues associated with conventional eNoses such as measurement stability and repeatability, are a thing of the past, due to the elimination of all polymers, chemical coatings, or other materials, which tend to cause instability over time. The zNose® instead uses a single vapor sensor produced from single crystal quartz without any absorbent coatings. 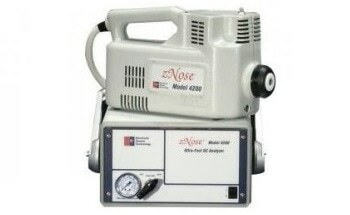 The zNose® maintains calibration, under most conditions, without adjustment for up to 30 days. Precision and repeatability are exhibited in the offset-waterfall display of Figure 7. Here, successive measurements on a sample bottle containing TCA vapors are illustrated. The systematic decrease in signal level with each measurement is because of the removal of 5 ml of vapor with each measurement. Adapting for this systematic withdrawal, the standard deviation between measurements is generally 2-3%. Figure 7. Offset waterfall display showing repeatability of 6 consecutive measurements of a 40 milliliter vial containing DCA, TCA, and PCA vapors. Decrease in signal level is due to removal of 5-milliliter volume with each sample and test. It is more difficult to measure part-per-trillion levels of TCA in wine than water because there simultaneously can be other compounds in wine at part-per-million concentration levels. This demands an instrument with a very high dynamic range and excellent baseline separation so that both low and high concentration levels can be accommodated in a single measurement. A QC test for corks needs the corks to be soaked in a neutral white wine solution for 24 hours. Then testing can be done to detect the presence of TCA. In most wineries, a panel of experts conducts the test with an olfactory detection threshold of 5-10 ppt. A series of 10 neutral wine solutions, recognized by an expert panel as having TCA were acquired from a California winery. The aroma from each sample was analyzed to check if TCA in the aroma could be recognized by the zNose®. A representative test result for a neutral wine sample is illustrated in Figure 8. The zNose® was able to detect and quantify the amount of TCA in each wine’s aroma. The reaction to a 1 ppb TCA calibration standard is overlaid in red. The presence of 85.5 ppt TCA can plainly be seen and as anticipated was above the odor threshold (5-10 ppt) of the expert panel. In these tests, a comparatively small 5-mm sample of headspace vapor was preconcentrated (<1 minute) with a <1 minute GC analysis and a modest 30 °C detector temperature. By lowering the detector temperature and preconcentrating a larger sample of headspace vapor, the zNose® can quantify concentrations of TCA below 1 part-per-trillion. Figure 8. Test chromatogram of a simple wine used to extract TCA from corks. TCA calibration response is shown as overlay in red. A neutral white wine to extract TCA from corks is extensively used in the US; however, a number of cork manufacturers use a water/methanol solution. In this case, there is less chance of bumping into an interfering compound with the same retention time of TCA. Still, in real wines like a Chardonnay or Merlot there are a substantial number of hydrocarbons like caproate and caprylate, which can create elevated baselines and otherwise mask the existence of TCA if their concentration is over 1 ppm. The zNose® is the first electronic nose that has accomplished the same or better sensitivity to 2,4,6 TCA as a panel of wine experts. Besides TCA, there are numerous other hydrocarbons in wine and wine production which can either improve or destroy the quality of the wine. In fact, the whole wine process is controlled by hydrocarbons. The zNose® technology presently can test and quantify all hydrocarbons in wines with molecular weights between 50 and 300. The zNose® is a quick and accurate olfactory instrument built to support and not replace testing by sensory experts. Instruments can never substitute the human sensor; however, the capability of quantifying and understanding the human perception of a wine’s chemistry may provide valuable understanding into how to describe and quantify wine quality in chemical terms. Once the optimum chemistry is fixed, instruments like the zNose® will be able to compare and monitor the chemical composition and quality of the total wine production process. Although this article focuses on taints in wine, it should be noted that not all TCA contamination results from corks and that its presence can also come from persistent microbiological activity within the winery itself. 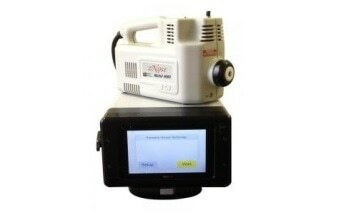 An electronic nose can be used to detect and screen any container, vessel, or building for TCA. It is not unusual to discover TCA in wine cellars or cooperage. Applied as an ambient air monitor, the portable zNose® is designed to detect TCA and a number of other tainting vapors at sub-ppt levels. Microbial activity is not the cause for all TCA contamination. Shipping containers can be a source of chlroanisoles as these compounds can travel quickly and easily equilibrate and coat all surfaces within the container. Other sources of TCA can be PCP-treated wood used in the building of wine cellars. This can rapidly contaminate the barrels, atmosphere, wines, corks, tanks, and everything else within the cellar. Glass bottles have to be regarded as another potential source of chlroanisoles and other contaminating compounds in bottled wine. The electronic nose is an effective instrument for checking and quantifying cleanliness in bottles and various other containers used in the wine production and storage. An electronic nose can screen the concentration of composition of fragrances supportive to the overall bouquet and good taste of the wine as well. The electronic nose is a useful instrument for keeping the precise chemical composition of an award winning wine and warning of destructive taints or alterations in composition, which could detract from the wine’s overall quality. The precision and accuracy of wine testing often requires difficult testing methodology to be used. Long-column GCs are costly, not portable, and can only measure 10 samples in an eight-hour period. However, with the zNose® technology, over 320 samples can be measured in one day. 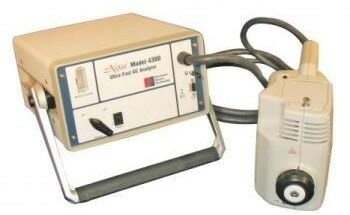 This is a 30X increase in productivity results in a very short pay-back period for the tool. TCA in delivered wines is comparatively rare, occurring only in 1-2% of wines shipped. This is achieved due to effective testing and screening by wineries before their product is shipped. Real quantities of wine rejected due to TCA tainting are not as well known; however, the number is said to be significantly higher. These losses signify a great potential gain in terms of more wine shipped and customer satisfaction and are cost effective reasons to use electronic noses in wine production.